PPGI coil use hot galvanized steel sheet, hot aluminium-zinc plate, electricity galvanized sheet as material, the surface pretreatment (chemical skim and chemical conversion processing),coated on the surface layers of organic coatings live, then baked into the curing products. because of different color with organic coating color steel plate, hereinafter referred to caitu volume. Use galvanized steel band for the base colour coating steel strip and the zinc layer is effective to protect outside, zinc layer of organic coating on the cover and the protection, prevent steel with rust, service life long than galvanized belt,about 1.5 times. Caitu volume has advantages, beautiful and good corrosion resistant performance, and can be directlyprocessing,mainly used in the advertising industry, construction, household electrical appliance industry, electrical industry, furniture industry and transportation. 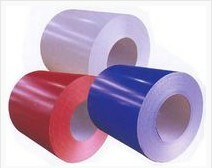 Caitu roll coating according to use different environment used to choose the appropriate resin, such as polyester silicone polyesters, PVC plastic sol, assembling partial vinyl chloride, etc.Use -s can choose according to utility. The self-cleaning PPGI products are featured with improved hydrophilic property and anti-contamination ability. Dust and other contaminants existing on the surface of these products can be washed away by rain. Although similar products have been used for the construction industry, Sutor improved and tailored the products for a large scale use by the solar energy industry. They are typically used to manufacture storage tanks of solar water heaters and related parts.